It is fair to say that both defences were on top in Saturday’s gritty goalless draw at Coleraine Showgrounds. While there was chances on the day, neither side really produced their best free-flowing football due to the rearguard action from both teams. After the game both managers talked uptheir respective defences and their efforts on the day. New Coleraine boss Rodney McAree had special mention for veteran centre back Steven Douglas, who put in a superb display as Gareth McConaghie missed out through injury. 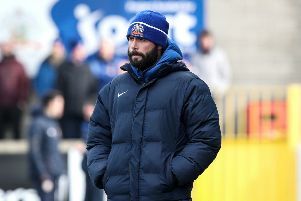 “I think the pressure came from Linfield was for 10 or 15 minutes, but when you play against them you always expect to be under the cosh for a period of time,” said McAree. “It was a good performance, a clean sheet and not many teams will keep Linfield at bay. Linfield have proved this season that they are very hard to score against as they’ve only conceded once. “Whenever you’re missing certain personnel from your starting eleven, you’re maybe thinking it could be too tough an ask, but the players who came in were excellent. “I thought we withstood it, our two centre-halves were terrific and I don’t know how Steven Douglas does it at 41-years-old. “He came on against Ards and I was in the stand thinking ‘what’s going on here’ but honestly he’s a Rolls Royce and makes it look easy. His opposite number, David Healy, was also pleased with the defensive performance of his men, who have conceded only one goal so far in the league this season. “It’s very pleasing to come away with a clean sheet, I thought we defended very well,” he said. “Eoin Bradley is a handful, when he came on he wanted to prove a point, he’s physical, can throw boys about and creates a bit of uncertainty. “But as I say we defended well. It’s four of the same back five who played every week when we were successful. “We’ve thrown Josh Robinson into the mix, who’s improving week in, week out. “When we did win the trophies they played most of the games, there’s a good unity there. Last year it didn’t happen for whatever reason. The league leaders hit the woodwork twice in the closing stages, but Healy felt a draw was probably a fair result overall. “I wouldn’t say our late rally gave us a right to win the game today,” he said. “I think both managers would probably say there wasn’t too much attacking football from either side. “The pitch is difficult, there’s a lot of sand on it which makes it difficult to play on. “Leaving a place like Coleraine with a point and a clean sheet we’ll have to settle for that today. McAree was pleased with the energy his side showed, as they took the game to Linfield. “I thought we showed great energy and tempo especially in attacking areas,” he said. “Jamie’s (McGonigle) runs were exceptional and he put Linfield’s defence on the back foot straight away. “His chance in the first-half was a well drilled effort, ‘Parky’ has cut in from the right-hand side and Roy Carroll is going the other away and actually saves it with his legs.